Gov. Tony Evers delivered his first State of the State address to the legislature on Jan. 22. In his speech, the governor said the state of the state is that "we've got work to do, and we're ready for bipartisan solutions." Continue reading about the State of the State. Assembly Speaker Robin Vos (R-Rochester) delivered the Republican response to Gov. Tony Evers's first State of the State address. Vos said the state of the state is strong, highlighting successes including Wisconsin's strong economy and business climate, low taxes, and investments in education. Continue reading about the Republican response. In their first floor session of the year on Jan. 22, the Assembly passed a bill placing a state-level prohibition on pre-existing conditions exclusions, if the Affordable Care Act (ACA) is repealed or is otherwise unenforceable. Both chambers of the legislature also passed a resolution extending the deadline for Gov. Evers to introduce his 2019-21 state budget. Continue reading about the floor sessions. The first Marquette University Law School (MU) poll of 2019 was released on Jan. 24. This is the first MU poll since October (before the 2018 election). The poll surveyed 800 registered voters in Wisconsin on where the state is headed, Wisconsin politicians, policy proposals, and potential 2020 candidates. Newly inaugurated Gov. Tony Evers is continuing to fill appointed positions in the administration. Recently announced appointments include Tourism, Department of Veterans Affairs, and Department of Natural Resources staff. Eighteen new members were officially inaugurated into the Wisconsin Legislature on Jan. 7, 2019. Over the next several weeks, HCG will highlight each new member of the legislature. This week, meet Reps. Jodi Emerson (D-Eau Claire), Staush Gruszynski (D-Green Bay), Kalan Haywood (D-Milwaukee), and Jesse James (R-Altoona). The start of a new legislative session means Wisconsin's biennial budget process is beginning. This week, the legislature gave Gov. Tony Evers a one-month extension from the typical late January deadline. Gov. Evers will give his budget address on Feb. 28. A coalition has filed a complaint seeking to deem the legislature's 2018 extraordinary session legislation unconstitutional and unenforceable. The complaint argues that the extraordinary session was not convened in accordance with the Wisconsin Constitution, which authorizes the legislature to meet only as provided by law or when convened by the governor (Wis. Const. Art. IV, § 11). However, a recent memo from Wisconsin Legislative Council to Assembly Speaker Robin Vos (R-Rochester) plainly states that convening an extraordinary session does not violate the Wisconsin Constitution. Continue reading about the complaint. New poll shows public support for Medicaid expansion, education funding: Wisconsin State Journal, January 24, 2019. Rebecca Kleefisch takes on new role in Washington: Madison.com, January 24, 2019. 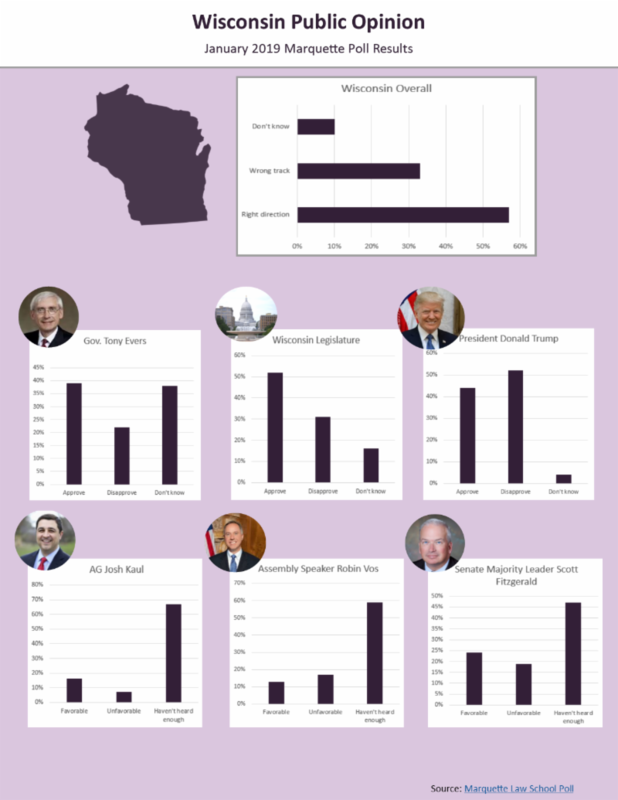 Spending in 2018 gubernatorial, attorney general races reaches record levels: Madison.com, January 24, 2019. Lawmakers not sure if bill covering pre-existing conditions will advance: Beloit Daily News, January 24, 2019. Marquette poll shows support for Medicaid expansion in Wisconsin: Capital Times, January 24, 2019. Tony Evers now says he'll ask for approval to withdraw from the Affordable Care Act lawsuit: Wisconsin State Journal, January 24, 2019. Tony Evers reverses course on withdrawing from Affordable Care Act lawsuit: Wisconsin State Journal, January 24, 2019. Milwaukee leaders have choice words for utility in solar standoff: Midwest Energy News, January 25, 2019. Trump eyes action to limit states' powers to block pipelines: Bloomberg, January 24, 2019. State issues initial Line 5 tunnel project permit amid Nessel review: Detroit News, January 24, 2019. Hi-Crush reopens one mine, closes another; cites shifting demand for frac sand: Wisconsin State Journal, January 24, 2019. New governors target climate change from day one in vulnerable Great Lakes region: Inside Climate News, January 24, 2019. Sexual assault victims in Wisconsin often wait months to see charges filed, review shows: Appleton Post-Crescent, January 25, 2019. Tony Evers seeks approval from Legislature to withdraw from Affordable Care Act lawsuit: Wisconsin State Journal, January 25, 2019. Marquette poll shows changing attitude toward marijuana legalization in Wisconsin: WSAW, January 24, 2019. Kaul asks lawmakers for permission to leave ACA lawsuit: Wisconsin Public Radio, January 24, 2019. Federal court delays Wisconsin redistricting trial: Wisconsin Law Journal, January 24, 2019. Judicial Council takes first crack at changes to Act 235: Wisconsin Law Journal, January 24, 2019. Kaul rejects Evers directive to withdraw from lawsuit: Associated Press, January 24, 2019. Tony Evers to commit $31 million in budget plan for Marinette Marine: Wisconsin State Journal, January 25, 2019. Midwest "roadmap" aims to unlock emissions benefits of EVs: E&E News, January 24, 2019. Teaching about Trump: Republican lawmaker criticizes UW-Madison professor's syllabus: Wisconsin State Journal, January 24, 2019.